Rope work, handling ascender, glacier travel, crevasse rescue, self-arrest technique, and, of course, walking in snow shoes and crampons. If you are joining an organized expedition – you most probably will have time for refresher while you are waiting for weather. 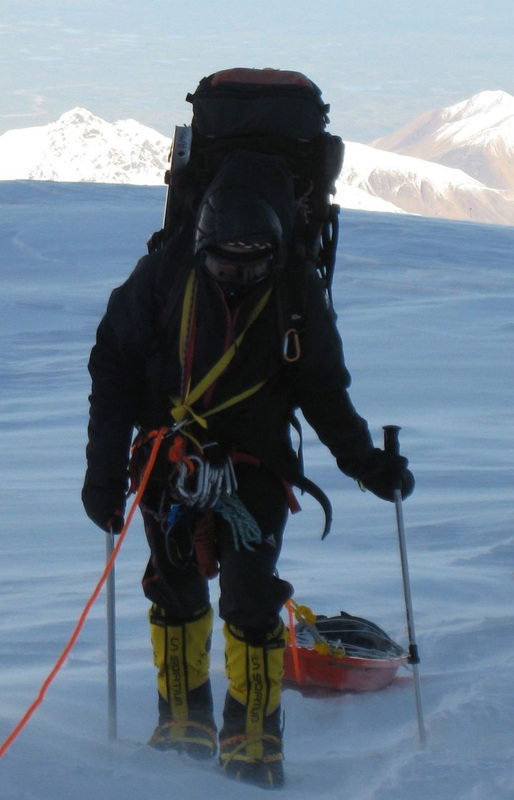 If you organize the expedition yourself – you are definitely not an amateur. Train, train, train – all with a heavy backpack. The advice to walk with a backpack and drag a car tire tied to your harness is not a joke. It looks hilarious, though. A backpack of this size and weight is easier to carry than you think and that is the whole purpose of the training – to take away anxiety of “how the hell I’m going to do it”? You may want to feel fairly comfortable running a half-marathon on a bi-weekly basis in addition to your ordinary training routine and do some 20 k uphill / weekly walking with a 25 – 30 kg backpack. Outdoor hiking is best, but if you come from a flat urban area (like I do) – walk stairs, or stairmaster & treadmill with max elevation in the gym. Mail me if you want details. During training, surprise yourself by adding an extra bit when you’ve thought it’s over. It is a good way to teach mind to accept surprises, mobilize and stretch for extra resources. Typically on arrival at the camp you have another 2 hrs of shoveling snow and pitching the tent, so this skill will be useful. Put on a few kilos before the expedition – your body may need an extra stash for added warmth and you will lose them easily. You are going to spend prolonged periods of time in the tent with the people you may not know. (The standard is 3 persons in a 3-men tent, can be crammed up to 4 at the high camp). One cannot avoid getting irritated. Get armed with sense of humor and do not take things personally. Everybody is stressed and tired and worrying. Just take a good laugh about it – you have chosen to spent the vacation that way! Think how to feel private even in the crowded tent. It may be ear plugs, a book or iPod. You need to detach and forget about others around you to recuperate morally. © Copyright 2012 by Climb the Planet. All Rights Reserved. Contacts.